August 1998. Wind 25kts (estimated). 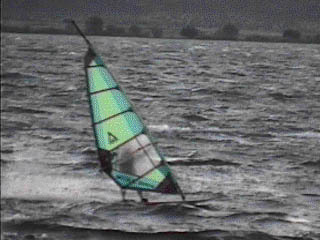 Windsurfing (unidentified sailor) on the Columbia River at Vantage, WA. Just an hour earlier, I was stranded downstream on my longboard with a big 7.4 sail, when the winds picked up in the late afternoon. I kept being blown over by the overpowering wind. Needless to say, I had to dismantle my rig and carry the parts one at a time back to my launch site. This picture was captured from 8mm video using a Snappy (320x240, 256 colour mode), and then converted to GIF. Methow Valley Mountain Bike Festival. 1998, Winthrop, WA. Racing and touring events in a quaint frontier-style town. Great singletrack riding on rolling hills in central Washington state. Pedal the Pinchot Mountain Biking Tour. 1998, Cougar, WA. Challenging ride up the side of Mt. St. Helens. Starts off with fire roads, then changes to singletrack. Finally into the lava field you see above. New England Mountain Bike Festival. September 1999, Randolph, VT.
Fall mountain bike festival in central Vermont. Sidney Days Build-A-Boat Competition. July 1998, Sidney, BC. Contest usually run on Sidney Days. Buy materials under a very tight budget, build a boat, and race it that afternoon. Outdoor concerts. The best kind for great scenery and decent sound in many cases.